In American culture, death and mortality are often seen as taboo subjects because no one really likes to think about them. However, death comes in many pretexts. Whether we rage against the dying of the light or eagerly embrace the darkness, we must all find our own way. Throughout most of American history, death, sometimes by violence and often by sudden disease, was an everyday experience. Today it is remote. People no longer die at home, but in nursing homes, hospitals, or hospices. When they die, they do so within a cultural structure that may not include close, supportive families or ingrained cultural rituals for acceptance of death and grieving. At the same time, a deep sensibility of optimism and hope has always been a part of the American psyche. Death in the American mind is something for the distant future, and we hope they invent a cure before we get to that place. The Irish, however, have a very different relationship to death. Generally speaking, the Irish people are known for being gregarious and polite, with a belief in good luck, and uplifting spirits, especially when it comes to enjoying good partying. The most well known is the Irish Wake. During a person’s final moments, families gather at the foot of the bed to sing the Five Sorrowful Mysteries of the Rosary, a lullaby to cradle their loved ones into death. Surrounded by those who know them best and care about them most, the dying come rest. And then the living’s responsibilities begin in earnest. Upon death, men dig the deceased person’s grave by hand, a sign of dedication and a labor of love. Every male family member then gathers together to carry their loved one’s coffin on their shoulders to the grave, while others stand outside the deceased person’s home as the coffin is carried out the front door and placed onto two household chairs on the lawn. The walls of the house are splashed with Holy Water. Then the coffin is lifted into the hearse and the chairs are kicked over to mark an irreversible rupture between the living and the dead. Such is the Irish way of death. If you’ve only seen the movie version, you might think it’s just another occasion for social drinking. You’d be wrong. In My Father’s Wake: How the Irish Teach Us to Live, Love, and Die, Kevin Toolis examines death from an Irish perspective. Toolis simply clarifies that death and funerals in Ireland are seen as a social responsibility and communal act of kinship. An Irish born writer and BAFTA- winning film maker, Toolis is the critically acclaimed author of Rebel Hearts: Journeys within the IRA's Soul (1996, St. Martin Press) which has been featured in the New York Times Magazine and the Guardian. “Death is a whisper in the Anglo-Saxon world . . . We have pulled the curtains across, privatized our mortality . . . Officially the deceased have become obscene.” But on a remote island off the coast of Ireland's County Mayo, death has a louder voice. Along with reports of incoming Atlantic storms, the local radio runs a daily roll of ordinary deaths. And the islanders go in great numbers, often with young children, to be with their dead. They keep the corpse and the bereaved company through the long hours of the night. They dig the grave with their own hands. It is a communal triumph in overcoming the death of the individual. 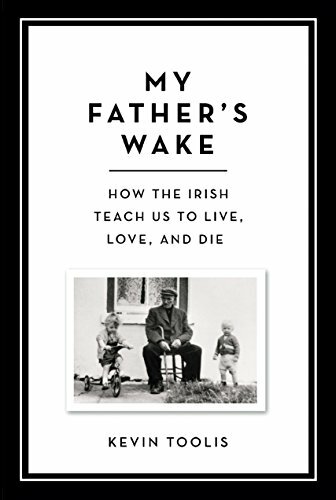 In this stimulating and poignant narrative, Kevin Toolis armed with his Irish heritage gives a heart wrenching description of the death and wake of his father as he delves into the broader history, rituals, and meaning of the Irish wake. With an inspiring and refreshing message at its core, My Father's Wake rejoices in the spiritual depth of the Irish views on mortality. But do not be mistaken, this book’s purpose is not to solve the meaning of life, but it does ask some very challenging questions. Thinking about our own death does inescapably return to the existential questions: Is this the life I wanted? Or still want? Can we learn to deal with mortality and death in a better way—by living and loving as the Irish do.